Often a significant component on your estate or farm and frequently forgotten about. We at Land Management (Scotland) Ltd have extensive experience of managing woodlands whether they are out and out commercial blocks, amenity or sporting designed. No matter what they must be attended to. We have recently seen a significant rise in the value of timber and the future looks positive for all grades of timber. Previously uncommercial plantations may now be viable and with the rapidly developing biomass market this is looking likely to stay with us. Fuel costs however have threatened this recent resurgence as has the new grant regime. 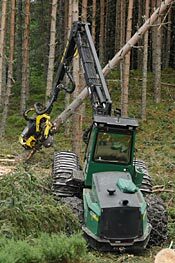 We work closely with forestry management companies to ensure that your woodlands generate as much for you as they can whilst also continuing to meet their objectives whether as a shelter belt, amenity, sporting or purely tax efficiency. We would be delighted to meet with you and discuss your woodland ideas.